Cole Custer led a Bill McAnally Racing charge in the NASCAR K&N Pro Series West season opener, capturing the win in his No. 00 NAPA AUTO PARTS/Haas Automation entry at Phoenix International Raceway on Thursday. Custer’s teammate, Nick Drake, finished third in the No. 55 NAPA AUTO PARTS Toyota. BMR missed a podium sweep, however, when Brandon McReynolds suffered damage to his No. 16 NAPA AUTO PARTS Toyota in the final laps and faded from second to finish eighth. Custer’s win in the Talking Stick Resort 75 came in just his third series start. The 16-year-old Ladera Ranch, Calif., driver was fast in practice and turned a fast-lap of 131.536 mph in qualifying to win his second straight pole at Phoenix. He went on to lead the most laps in the race and pulled away from the field in a green-white-checkered finish, due to a late-race caution that extended the event distance. The victory comes four months after Custer saw a win slip away on the final lap at Phoenix. He had dominated the competition last November – winning the pole and leading 49 of 50 laps before contact from another car on the final lap left him to finish sixth. In addition to this K&N West win, Custer had two victories as a rookie last season in the NASCAR K&N Pro Series East, as well as two poles. In addition to competing in select events in the East and West divisions of the K&N Pro Series this year, Custer is set to race a limited schedule in making his debut in the NASCAR Camping World Truck Series. For Drake, his third-place finish came in his debut in the K&N West, where he plans to make a second start later in the year. 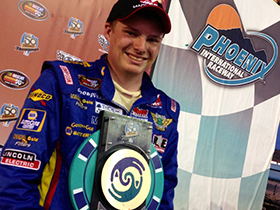 The 18-year-old from Mooresville, N.C., is battling for the Sunoco Rookie of the Year Award this season in the K&N East – where he finished fourth in the UNOH Battle At The Beach at Daytona International Speedway just over a week ago. It appeared McReynolds, who will battle for the title in the K&N West this year, would give car owner Bill McAnally a podium sweep at Phoenix – but while running second late in the race he was caught up in an incident when a lapped car blew a tire. In addition to the strong performance by Custer, Drake and McReynolds – D.J. Kennington finished fifth at Phoenix in the No. 81 Northern Provincial Pipelines entry, which was built and prepared by BMR. It marked a career-best series finish for Kennington, a two-time champion in the NASCAR Canadian Tire Series presented by Mobil 1. He had previously registered three top-10 finishes in BMR cars at Phoenix. The NASCAR K&N Pro Series West race from Phoenix will be televised on FOX Sports 1 on March 7 at 1 p.m. ET.